The UL Men’s 1st Eight recorded the best performance by a UL 8+ in 25 years to make the final of Temple at HRR, as UL send four women to World Cup III in Lucerne, seven athletes to U23 World Champs, five crews to the European University Rowing Championships and three crews to race in China. The UL 1st Eight made the final of the the Temple at HRR 2017, after wins against Cornell University’s undefeated lightweight National Champions and Yale University. This was the first appearance by a pure UL 8+ in an eights final at Henley Royal Regatta for 25 years. Proof that the UL rowing program is building and in very healthy shape. The UL Men’s 1st 8+ was joined in the draw by the 2nd 8+, a PA coxed four and a Women’s quad. 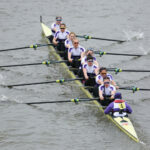 UL also had representation in both the Senior and U23 British Women’s eights, who raced each other in the Semi at HRR. The summer international racing season now starts for UL. First up was World Cup III in Lucerne, Switzerland this weekend. Sara PARFETT (King’s) and coxswain Matilda HORN (alumna) took a Bronze Medal, after winning a Silver medal at World Cup II, in the Great Britain Women’s Eight. Emily CRAIG (alumna) raced again in the GB Women’s Lightweight Double, coming 6th this time. And Robyn HART-WINKS (UCL) competed at her first World Cup event, in the GB Women’s Lightweight Quad, winning a Silver medal. The U23 World Rowing Championships this summer take place in Plovdiv, Bulgaria. Seven UL athletes have been potentially selected. 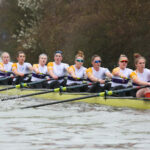 Georgia STATHAM (UCL), Ally FRENCH (Birkbeck), Charlotte HODGKINS-BYRNE (Royal Holloway) and Ellie STEWART (Tyrian) will all race in the Great Britain Women’s Eight, coached by UL Chief Coach Phil Gray. Josh KENT (UCL) and Patrick SULLIVAN (UCL) have been selected as stern pair of the GB Men’s Coxed Four. Arthur DOYLE (Tyrian) will race in the GB Men’s Eight. UL Coaches Hugo Gulliver and Brian Young will coach the GB Women’s Four and GB Men’s Eight respectively. The European Universities Rowing Championships (EUSA) takes place next week, in Serbia. 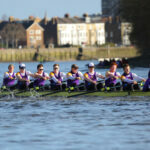 ULBC qualified nine boats via BUCS Regatta. UL will be sending five boats to race in Serbia, including a Men’s and Women’s quad and a Men’s Eight. Following EUSA two separate touring parties head to China to race. A Men’s Eight departs mid July to race in two events. The second touring party, of a Men’s Eight and Women’s Four, depart after the World U23 Championships end, and will race in Chengdu. The final race in China brings to a close the 2016/17 season for ULBC. The 2017/18 season will be kick started with a cycling camp to the French Alps, kindly supported by one of our alumni. If you would like to join ULBC for the 2017/18 season please follow this link.